Already being hailed as “the modern reader’s Think and Grow Rich!,” this lively, funny, penetrating book, follows on the heels of Chandler’s previous international bestsellers 100 Ways to Motivate Yourself and 100 Ways to Motivate Others. 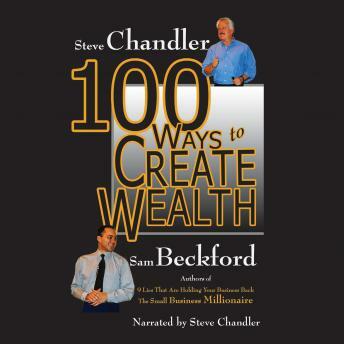 These 100 eye-opening ways to create wealth are drawn from the author’s successful careers, with many touching personal stories as well as stories and examples from the hundreds of clients these master coaches have advised. This book is chock full of ways to make money, deepen life’s pleasure, increase personal wage-earning power and start fresh entrepreneurial ideas right at home. Written for the age of the home-business entrepreneur, the book appeals to everyone from company CEOs, to life coaches, to stay-at-home moms, to internet fans to people who are simply thinking of converting that hobby into wealth. This is the deepest and most penetrating study yet of the psychology of prosperity, and the action steps necessary to produce wealth.